"Aww, you can transform? How adorable! Here, let me show you how a professional does it!" Most martial characters rely on manufactured gear such as a sword and a shield or natural endowments such as teeth and claws to survive on the battlefield. The warshaper finds those options sadly limiting, instead growing and evolving her own weapons and armor to suit the threat at hand. Blessed with the ability to change form at a moment's notice, warshapers delight in surprising their foes by growing massive claws, armored skin, or other unpleasant surprises. Warshapers must have some ability to change their form, and many are shapechangers such as dopplegangers and lycanthropes. Wizards and sorcerers who know the polymorph spell can take levels in the prestige class, as can druids who have mastered the wild shape class feature. Most warshapers can change their outward appearance in the blink of an eye, so they don't stand out among the ranks of their allies. Its not until the solider you're fighting grows a tentacle and fangs that you know you have met a warshaper. Race: Any (but see below). Change shape supernatural ability (aranea, hound archon, barghest, doppleganger, raskshasa, slaad). Polymoprh as a spell-like ability (astral deva, planetar, solar, couatl, marilith, bronze dragon, gold dragon, silver dragon, efreeti, leonal, guardinal, night hag, ogre mage, pixie). Able to cast the polymorph spell. Note: The alternate form ability (possessed by quasits, vampires, and others) is insufficient to become a warshaper. The warshaper’s class skills (and the key ability for each skill) are Balance (Dex), Climb (Str), Concentration (Con), Craft (Int), Disguise (Chr), Escape Artist (Dex), Jump (Str), and Swim (Str). Skill Points at Each Level: 2 + Int modiﬁer. All of the following are class features of the warshaper prestige class. Weapon and Armor Proﬁciency: Warshapers gain no proficiency with any weapon or armor. Morphic Immunities (Ex): A warshaper is adept at distributing her form's vital organs around her body to keep them safe from harm. Warshapers are immune to stunning and critical hits. Morphic Weapons (Su): As a move action, a warshaper can grow natural weapons such as claws or fangs, allowing a natural attack that deals the appropriate amount of damage according to the size of the new form. These morphic weapons need not be natural weapons that the creature already possesses. For example, a warshaper polymorphed into an ettin could grow a claw that deals 1d6 points of damage, or horns for a gore attack that deals 1d8 point of damage. If the warshaper's form already has a natural attack of that type, the weapon deals damage as if it were one category larger. 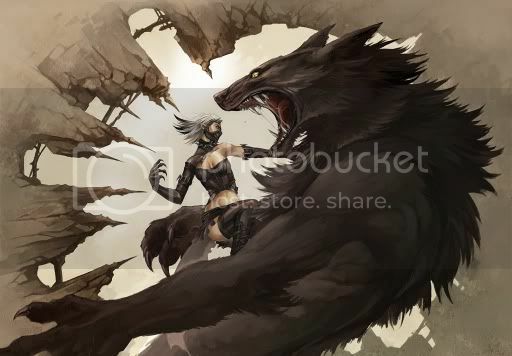 For example, a warshaper who used wild shape to become a dire wolf (Large animal) could grow its jaw and snout, enabling a bite attack that deals 2d6 points of damage (as a Huge animal), not the normal 1d8. A warshaper can change morphic weapons as often as it likes, even if it is using a shapechanging technique such as the polymorph spell or the wild shape class feature that doesn't allow subsequent changes after the initial transformation. Morphic Body (Su): At 2nd level and higher, a warshaper can use its precise control over its form to make itself stronger and heartier. It gains +4 to Strength and +4 to Constitution. Morphic Reach (Su): A warshaper of 3rd level or higher can suddenly stretch its limbs, neck, or other appendages outward, giving it 5 more feet of reach than the creature its emulating. Unlike most creatures, warshapers don't appear to have a longer reach until they actually use it. Moprhic Healing (Su): At 4th level, a warshaper becomes able to change its form where wounds appear, creating smooth skin where once were wounds. The warshaper gains fast healing 2, and if it spends a full-round action and succeeds on a Concentration check (DC equal to the total damage it has sustained), it heals 10 points of damage. Flashmorph/Multimorph (Su): A 5th-level warshaper gains one of two class features. If the warshaper has the ability to change form at will, such as from the change shape ability, the shapechanger subtype, or a polymorph spell-like ability, it gains the flashmorph class feature, allowing it to change form as a move action. If it casts the polymorph spell, has polymorph as a spell-like ability usable less often than at will, or has the wild shape class feature, it instead gains the multimorph class feature. Multimorph allows a warshaper to change forms multiple times during the duration of the spell, spell-like ability, or class feature that enables her to change form. For example, a wizard/warshaper could polymorph into a troll for 2 minutes, then change into a red dragon for 4 minutes, and then spend the rest of the spell's duration in the form of a hill giant. Each change requires a standard action, and only the first transformation heals the warshaper. If the warshaper changes into its natural form, the spell, spell-like ability, or use of wild shape ends.